Is it really Monday already? Despite having taken the day of on Friday, I feel like I've been on the go since Thursday. In between going out with friends, running in a 5 mile race, and nearly dying from what I gather was food poisoning, I made time to work on my vegan baking skills. 2. These cookies look pretty boring (if not mis-shapen) when you take them out of the oven, or in my case, take them to a party. But when you bite into them - WOW! It's like eating the cookie equivalent of a peanut butter cup. 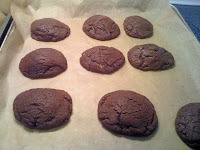 The outer chocolate cookie is firm but the center is soft and delicious. Stay tuned for additional adventures in vegan baking. I hope to try out at least one new recipe from the cookbook every week...later this week I plan on making magical coconut cookie bars.